Preheat the oven to 200˚C, gas mark 6. Line a 12 hole mini muffin tin with paper mini muffin cases. Place the butter and sugar in a mixing bowl and beat until it turns pale and fluffy. Add the egg, mix well, then stir in the flour, raisins, apple, vanilla and poppy seeds. 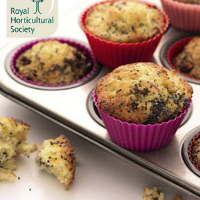 Spoon a little into each muffin case, sprinkle with extra poppy seeds and bake for 10 minutes, until golden; you know it's cooked when a skewer inserted comes out clean.